A photograph of the headstone of Anandabai Joshee. 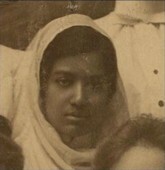 Dora Chatterjee from her class photograph as a student at the Woman's Medical College of Pennsylvania. She graduated with her M.D. in 1901. Photograph of Gurubal Karmarkar, a graduate of Woman's Medical College of Pennsylvania in 1892. Photograph of Gurubai Karmarkar, an 1892 graduate from Woman's Medical College of Pennsylvania. Photograph of Hu King Eng, Gurabai Karmarkar, and Mary H. Platt, members of the Class of 1892 at the Woman's Medical College of Pennsylvania. From left: Dr. Mabell Sammons Hays, Dr. Mary Maya Das Lal, Dr. Anna Ruth Winter Korteling. Mabel and Anna graduated from the Woman's Medical College in 1923 and Mary in 1908. The photo was taken in Allahabad, India.